Spatial and temporal data is plentiful on the Web, and Semantic Web technologies have the potential to make this data more accessible and more useful. Semantic Web researchers have consequently made progress towards better handling of spatial and temporal data.SPARQL, the W3C-recommended query language for RDF, does not adequately support complex spatial and temporal queries. In this work, we present the SPARQL-ST query language. SPARQL-ST is an extension of SPARQL for complex spatiotemporal queries. We present a formal syntax and semantics for SPARQL-ST. In addition, we describe a prototype implementation of SPARQL-ST and demonstrate the scalability of this implementation with a performance study using large real-world and synthetic RDF datasets. We thank Professor T. K. Prasad for his helpful comments on our formalization of SPARQL-ST, and Cory Henson for his comments on a draft of this work. This work is partially funded by NSF-ITRIDM Award #0714441 (SemDIS: Discovering Complex Relationships in the Semantic Web) and by NSF Award #IIS-0842129, titled “III-SGER: Spatio-Temporal-Thematic Queries of Semantic Web Data: a Study of Expressivity and Efficiency (09/01/2008-08/31/2010)”. Dan Brickley and Ramanathan V. Guha. RDF vocabulary description language 1.0: RDF schema. W3C recommendation. http://www.w3.org/tr/rdf-schema/ . Patrick Hayes. RDF semantics. http://www.w3.org/tr/rdf-mt/ . Hewlett-Packard Development Company. ARQ - a SPARQL processor for jena. http://jena.http://sourceforge.net/arq/ . Joshua Lieberman. W3C geospatial incubator group. http://www.w3.org/2005/incubator/geo/ . Open Geospatial Consortium. 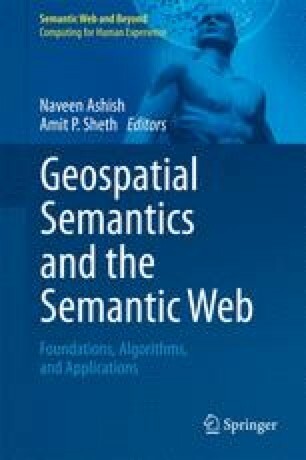 Open geospatial consortium geospatial semantic web interoperability experiment. http://www.opengeospatial.org/projects/initiatives/gswie . Eric Prud’hommeaux and Andy Seaborne. SPARQL query language for RDF, W3C recommendation. http://www.w3.org/tr/rdf-sparql-query/ . Raj Singh, Andrew Turner, Mikel Maron, and Allan Doyle. GeoRSS: Geographically encoded objects for RSS feeds. http://georss.org/gml .